Gayle Brandeis’s mother disappeared just after Gayle gave birth to her youngest child. Several days later, her body was found: she had hanged herself in the utility closet of a Pasadena parking garage. In this searing, formally inventive memoir, Gayle describes the dissonance between being a new mother, a sweet-smelling infant at her chest, and a grieving daughter trying to piece together what happened, who her mother was, and all she had and hadn’t understood about her. Around the time of her suicide, Gayle’s mother had been working on a documentary about the rare illnesses she thought ravaged her family: porphyria and Ehlers-Danlos syndrome. In The Art of Misdiagnosis, taking its title from her mother’s documentary, Gayle braids together her own narration of the charged weeks surrounding her mother’s suicide, transcripts of her mother’s documentary, research into delusional and factitious disorders, and Gayle’s own experience with misdiagnosis and illness (both fabricated and real). Slowly and expertly, The Art of Misdiagnosis peels back the complicated layers of deception and complicity, of physical and mental illness in Gayle’s family, to show how she and her mother had misdiagnosed one another. Gayle’s memoir is both a compelling search into the mystery of one’s own family and a life-affirming story of the relief discovered through breaking familial and personal silences. 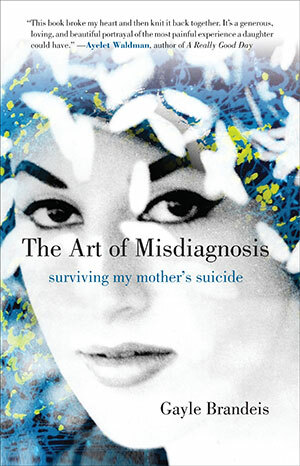 Written by a gifted stylist, The Art of Misdiagnosis delves into the tangled mysteries of disease, mental illness, and suicide and comes out the other side with grace.